On Friday morning, news broke that the Jets traded a 5th round pick to the Chicago Bears in exchange for Brandon Marshall and a 7th round pick. Just look at that sentence again. Fifth round pick, for Brandon Marshall. It always amazes me how people can be so negative about moves that make all the sense in the world, especially when that move involves the Jets. Without delving too far into the territory of an ridiculously sensitive fan who can't take it when their team is criticized, it's unfair how the Jets are treated as a joke no matter what they do. This is the case with Percy Harvin right now as well, because their midseason trade for him has been widely maligned, when he was actually pretty good as a Jet, considering that he was thrown into a bad offensive system midway through the year. Excuse that angry rant directed at no one in particular, but it's been on my mind. As for how this affects the on field product in New York, Marshall greatly improves a Jets team who were greatly in need of another receiver. I think Eric Decker is a number one receiver, and people who still vehemently refute that statement clearly did not watch enough of the Jets this past season. Even so, behind him are Jeremy Kerley, who is now able to settle into a more comfortable role as a third receiving option, Chris Owusu, and T.J. Graham. I really like Jace Amaro, but the Jets were in need of better players on the outside. And, look who's here. 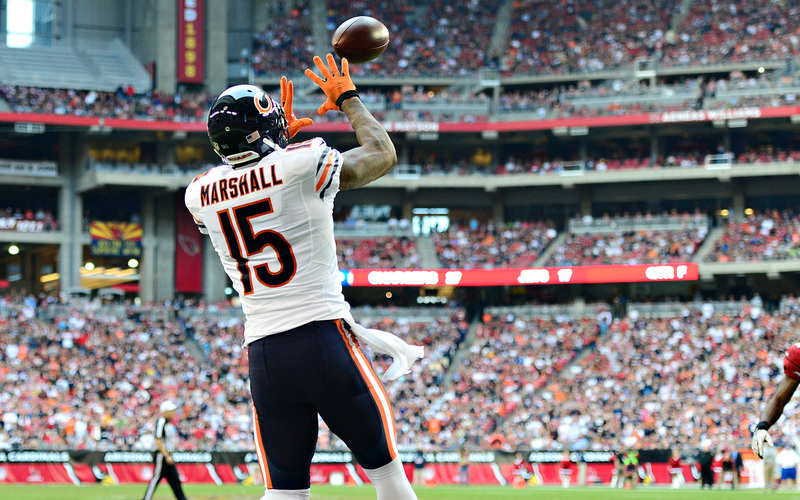 Brandon Marshall is one of the best receivers in football, and there's no way around that. Despite coming off an injury plagued 2014 campaign in which the entire Chicago Bears team looked like they were stricken with a horrible disease. An offense that featured Jay Cutler, Alshon Jeffery, Marshall, and Matt Forte struggled mightily at times, looking more like the anemic Jets of the past few years rather than a potent attack led by top players at QB, RB, and WR. Some of that was due in part to Marshall's injury troubles, some of that to Jay Cutler having the worst season of his career, some of that to Marc Trestman losing the team altogether in his second season, and some of that due to God knows what. No one will ever definitively be able to figure out why last year's Bears weren't an offensive juggernaut, but it simply didn't happen. Don't let that take away from any assessment of Marshall's merit as a force at wide receiver. He's been great since his time in Denver, and, turning 31 later this month, he certainly has a lot left in the tank. He did his best while being bitten by the injury bug, memorably scoring three touchdowns on Sunday Night Football against the Niners while on one leg. There's no doubt in my mind that he'll be healthy and ready to go in September, and will be awesome for the remainder of his deal. With Decker on the opposite end, the Jets suddenly have one of the best one-two punches of receivers in the league. Do the Jets currently have a quarterback? Marshall is adept at getting up for tough jump balls, and can make someone as inaccurate as Geno Smith look like he belongs in the NFL every once in a while. Okay sorry, I can't say that with a straight face. Marshall is capable of maximizing a quarterback's talents (assuming they have talent, unlike Geno), especially since opposing teams can't double team him or Decker because they know the other receiver will burn them. The Jets are immediately a better team than they were last Thursday, no matter who it is that starts the season under center for them. They're paying a reasonable price for a guy that has earned his money throughout his time in the league, and they gave up a mid to late draft pick to do it. But William, how does Marshall's personality affect the Jets' locker room? It doesn't. There's a narrative about Marshall being a headcase and alienating people wherever he goes, but I think that's largely overblown. I've yet to see a Harvin-esque smear campaign launched against him, but I'm sure it's coming soon. I'm not in the locker room with him, but I don't know for sure, but I'd bet that he's not on a Terrell Owens level of locker room issue. He'd widely seen as a very opinionated man, and I'm not going to use that to claim that he will mess up a team. Whoever the Jets get to be their starting quarterback, they're walking into a great situation. The acquisition of James Carpenter bolsters an offensive line that can still use some help, but is good enough as it is. Around the new guy will be Decker, Marshall, Amaro, Kerley, Chris Ivory, and whoever they get to compliment Ivory in the backfield. The best player out of these is clearly Brandon Marshall, so snagging him for a draft pick who was not going to yield a starter in the near future is an absolute coup. And we even got an additional seventh rounder out of it. There's no way to hate on this trade.